Spotted spurge is one of those weeds that seem to defy our best efforts to control it. It is a low growing plant that develops into a dense mat that can overgrow turf and compete with ornamental ground covers and annuals. 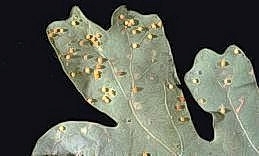 It can be characterized by its dark green tiny leaves, which often have a red spot about mid way down the center leaf vein. The stem, when broken, exudes a milky latex juice. The plant has a central taproot system that is capable of extending more than 2 feet into the soil. The tiny pinkish flowers abundantly produce a three-celled seed capsule that is 1/16-inch long or less very early in its lifecycle. Spurge can be very difficult to control once it becomes established so prevention is key. However, once it invades there are some things you can do to reduce its impact. and still others that look like horned or fuzzy balls. We do not normally recommend any type of control of these insects. However, some research indicates that if one leaves the infested leaves on the ground, the parasites of these little wasps are not raked away and it may moderate the population over time. As well, there is more “mulch” on the ground around the trees, which is a good thing. One of the fun things to do with the galls as they are beginning to fall off the tree is to just bring them into the house. As the galls warm, they begin to jump and wiggle around and make a snap crackle and pop noise…. 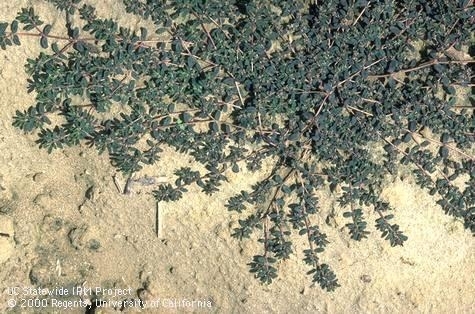 How Can I Control Creeping Wood Sorrel (Oxalis) in My Lawn? The lawn, from a distance, looks lush and green. When walking across it, however, the exploding seed pods of the densely growing oxalis spread seeds across my boots and across my lawn. In one year the newly planted cool season turfgrass has become an oxalis or creeping wood sorrel lawn. 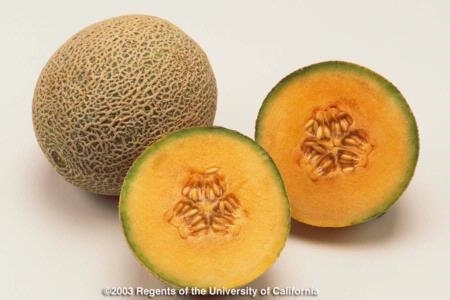 I have been growing the most wonderful variety of cantaloupes called “Athena” in my vegetable garden. This variety is to die for….sweet, firm, and longer lasting than the Tuscan varieties. The vines were vigorous, productive and gorgeous until the aphids moved in and started curling the leaves and excreting honeydew, making everything a sticky mess. I am partly to blame because I watched the small aphid population just explode to a huge problem. I knew I should have done something early on but I didn’t….my excuse was not enough time in the day. Nonetheless, there was also a large population of both ladybugs and parasitic wasps that I thought might do the job for me so I really didn’t want to spray a pesticide. Now the big question is, is it too late and will it matter to my melon harvest? Conventional wisdom says that aphid populations will drop when temperatures go above 100F. Well, we reached that number and then some so that is one reason to hope that the melon harvest can be saved. The second thing is that there are lots of predators and parasites available to help munch those hardy aphids that continue to survive despite the temperatures. What else could one do to manage aphids to save the melon? Well, here is my list and I am going to do these things because the reward of these perfect melons is a great motivator. Hose off the plants with a strong stream of water. This will clean up a lot of the honeydew and reduce the numbers of aphids on the plant. Do this in the early part of the day to avoid water droplets on the leaves during the hot part of the day. Spray them off daily if possible. When temperatures drop below 90F during the day, spray with an insecticidal soap, neem oil or summer weight oil and cover the undersides of the leaves as much as possible. These materials may be phytotoxic (cause damage) to some plants, so check labels and test them out on a portion of the foliage several days before applying a full treatment. These materials are considered least toxic materials and do not harm most beneficial insects that may be found on the plants. Where there is heavily curled foliage, prune that off to reduce the numbers of aphids that are inside the curled foliage protected from both predators and parasites and any water or pesticide sprays. 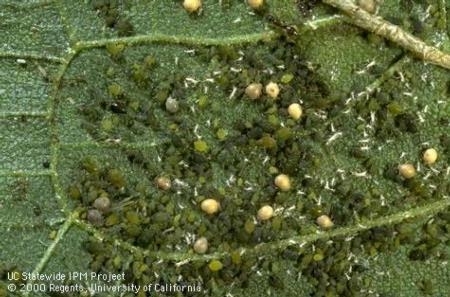 Plan to go to the farmer’s market for great melons if my plan doesn’t work…..
For more information on aphid management in your garden go to: http://www.ipm.ucdavis.edu/PMG/PESTNOTES/pn7404.html to learn more. 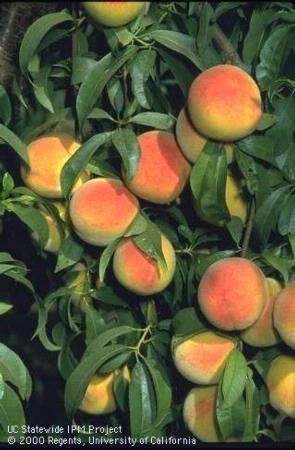 What should I be doing during the summer for my peach trees? Fertilize young trees monthly. Use 0.5 lb. urea or 25 lb. manure/tree/appl. Mature trees need 50% more. Water fertilizer in. If drip irrigated, do not exceed 1 oz. urea/emitter/mo. Drip irrigate daily or sprinkler irrigate about every 3 weeks. Maintain a weed free area around the base of the trees within 3' of the trunk with an organic mulch 3–4" deep.